Since I’ve become so hopelessly addicted to my ice cream maker, I’ve been trying to come up with ways to share the things I make with others. Unfortunately it is very hard to transport and share ice cream, so I was thinking about putting it in paper cups. Which somehow made me think, “huh, I bet if I brushed the insides of the cups with melted chocolate first, then stuck in a stick after pouring in the ice cream, I could make some pretty rockin’ ice cream pops.” Others were intrigued by this idea as well after I mentioned it on Twitter, so I decided to go ahead with it one day. I wasn’t sure at first what flavor I wanted to make the ice cream – vanilla, mint and coffee were my first thoughts and since I couldn’t decide I left it up to Twitter while I shopped for popsicle sticks. Mint was the overwhelming response, so when I got home Z and I went out to the woods to get some mint leaves. At first I didn't believe this was mint. I know what mint looks like – all pointy and spiky – so I didn’t trust when Z told me these shiny round leaves were mint. But he tore one in half and it WAS minty. When we got back to the house I found out it was wintergreen – well ok! Make sure you cut a slit! Since wintergreen is a lot gentler than your traditional peppermint or spearmint leaves, I used a bunch of them. 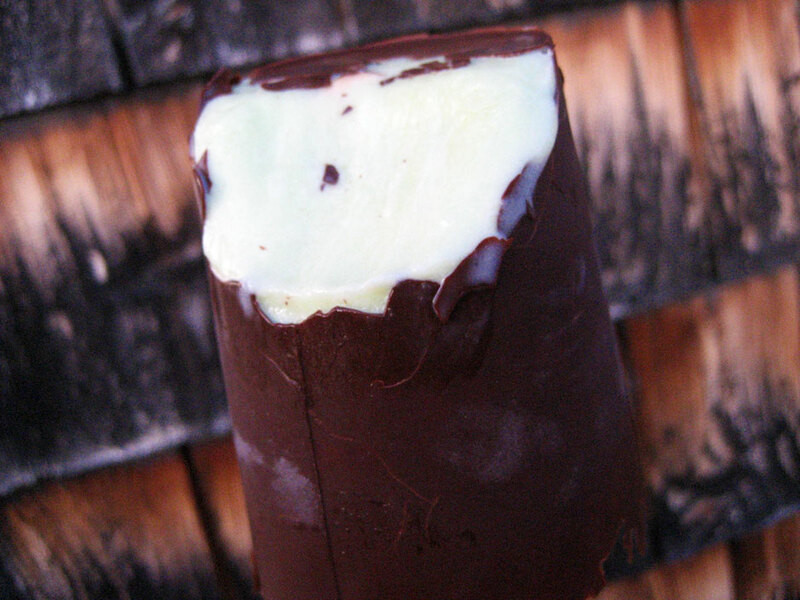 The result is a very minty, refreshing ice cream that goes GREAT with the chocolate coating. 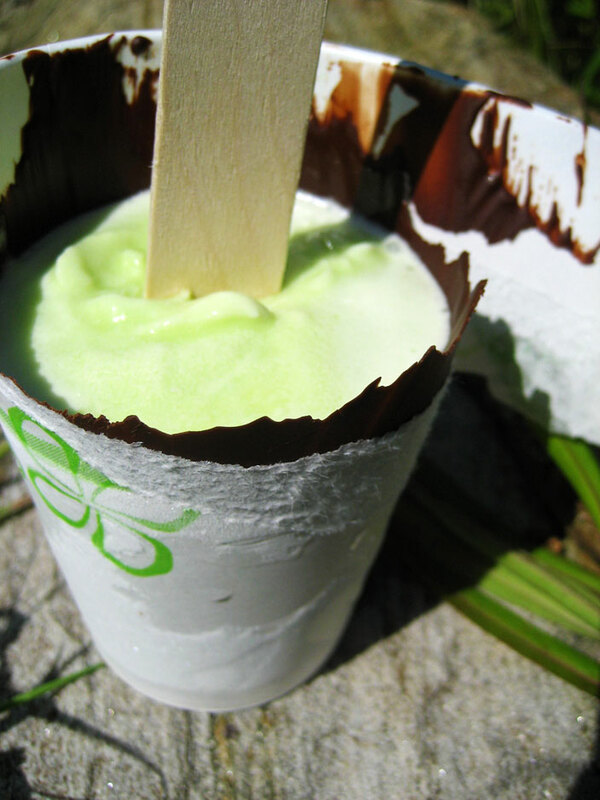 I was elated when the first two ice cream pops I served came out from their paper cup wrappings almost perfect. So the next day I took one outside to photograph in the sunshine. And the chocolate was shattered. I was concerned that I had tossed them around the freezer too much during my ongoing flurry of other simultaneous ice cream activities, so I just hoped that the rest weren’t like that and waited until the next day (because you can only eat so much ice cream in a day). This photo was taken with the last bit of sunlight. But at least the pop didn't shatter! There were only a few minutes of daylight left by the time Z was in the mood for an ice cream pop, so I told him he could have it outside on the porch because I needed to photograph it. Luckily it was still warm so out we went to snap a few pictures. Yeah, I don’t have the space or equipment to temper chocolate, so I “ghetto-tempered” it in the microwave. If you can’t temper chocolate in your kitchen, at least melt half of it then stir in the other half until smooth, either on the stovetop or in the microwave like I did. If you melt it all at once it will get ugly gray spots on it in the freezer. Your pops will still taste fine but they will be uuuugly, and the chocolate won’t have such a nice snap to it when you bite it. Another thing to consider would be a second layer of chocolate coating on the cups – if I make these again I would like to have a thicker shell. You could also cover the exposed ice cream with more chocolate. If you use smaller cups and fill them all the way it would eliminate the jagged edges that mine got. I also didn’t add alcohol to the ice cream like I normally do and I would suggest that anyone else trying this method also refrain from adding it. Reason being? Well, I add alcohol to make ice cream softer, but in this case you want it to stay hard and on the stick! However, if you just want to make the ice cream recipe and not the pop part, feel free to add a couple Tbsp of vodka, mint schnapps, Vandermint, creme de cacao…etc. Combine the cream, milk and sugar in a medium saucepan. Tear each mint leaf in half and add them to the pan. Bring just to a boil, then remove from heat and cover to steep for 10-15 minutes. Meanwhile, place half the chocolate in a microwave-safe bowl. Microwave on high for 30 seconds, then stir. Repeat until the chocolate is completely melted, then add the rest and stir until totally smooth. 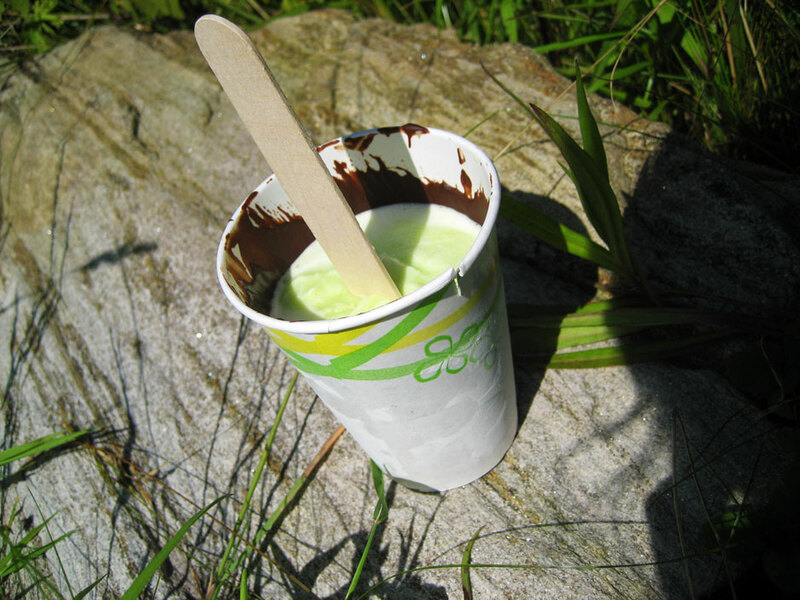 Using a clean paintbrush or another food-safe brush, paint the insides of small waxed paper cups (I used 9 oz. cups and got 7 pops filling them 3/4 full; use smaller ones if you want more/smaller pops) with a solid-but-not-too-thick layer of chocolate. Place in freezer. In a large mixing bowl, whisk the yolks with the salt. Strain the leaves out of the cream mixture. Temper the yolks by drizzling in a little of the warm cream mixture, whisking constantly. Add the rest of the cream mixture in a thin stream, whisking the whole time so your yolks don’t curdle. Once fully incorporated, return the mixture to the saucepan and cook over medium-low until the custard is thick (can coat the back of a spoon) but not boiling. Strain into a medium mixing bowl and (carefully!) whisk in the food coloring if you want your ice cream to be minty green. You will probably have to add a little blue to counteract the natural yellowishness of the custard. Chill over an ice bath and/or in the fridge until cold. Churn in an ice cream maker or follow my instructions to make ice cream with no mechanical help. 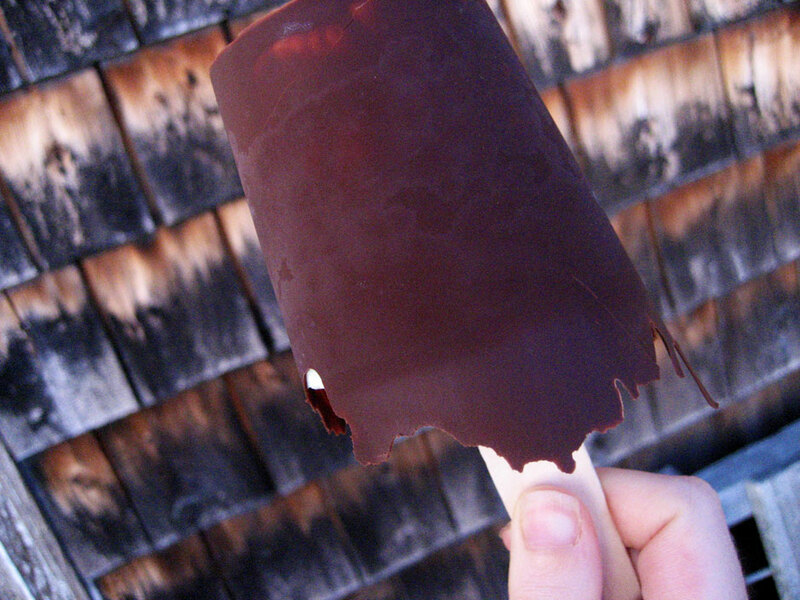 Once thick and mostly frozen, pour into prepared chocolate-lined cups and put a popsicle stick in the middle of each. Return to the freezer for a few hours to fully harden (overnight is probably best). 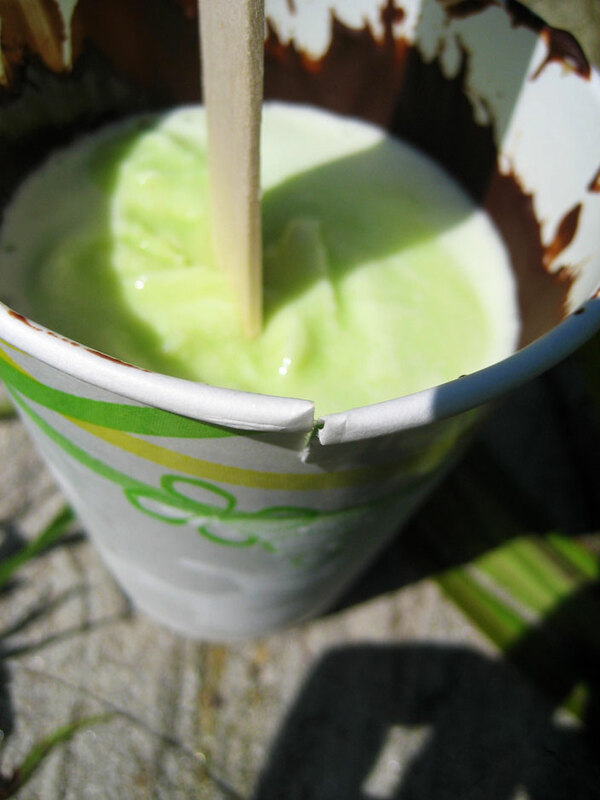 To serve, cut a slit in the rim of the paper cup and slowly rip it off in a long spiral, carefully popping the bottom of the cup off the top of the pop. One more note: if you make this using a different kind of mint (say, peppermint or spearmint) you should reduce the amount of leaves steeped in the cream by at least half and maybe quarters. 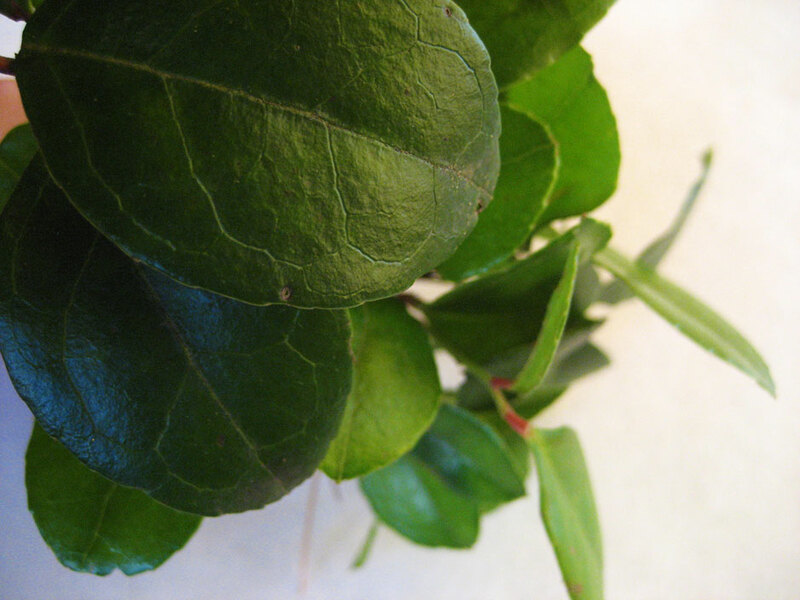 Wintergreen is very mild but other mints most certainly are not. You are an ice cream genius! This is such a great idea for parties (and I’m not just talking for the kiddies – I know quite a few adults who’ll scramble for these). I’ve never seen wintergreen before so thanks for the photo; however, I have spearmint growing like weeds in my garden. Usually, they’re destined for mojitos (lots of mojitos) but chocolate and mint are my husband’s favorite so they now have a different purpose. I love your pops! Very creative!! this is such a cute idea, they look gorgeous!! Great idea…looks yummie and refreshing.